About 20 pro-Palestinian demonstrators were killed and 325 injured yesterday when Israeli forces opened fire on them as they crossed the border from Syria into occupied territories, according to reports. Syrian state television said the protesters died as they crossed into Golan Heights, occupied by Israel since the 1967 Six Day War. The demonstrators descended from a hilltop overlooking the village of Majdal Shams towards the disputed border. Israeli soldiers had shouted ‘anyone who tries to cross the border will be killed’ before opening fire, it was reported. The country’s chief military spokesman, Brigadier-General Yoav Mordechai, said troops had opened fire but he could not confirm any casualties. Israel had been on high alert yesterday – the 44th anniversary of the Middle East war, when Israel captured Golan Heights from Syria – after thousands of Palestinian protesters stormed its borders last month. Several dozen demonstrators had gathered in an anti-tank ditch facing the Israeli frontier. They waved flags, shouted slogans and threw stones. The protests began around 11am with what appeared to be several dozen youths, brought in on buses. It gained strength through the day. By evening, the crowd had swelled to more than 1,000 people, who milled about, prayed and chanted slogans in an uneasy stand-off with Israeli troops in the distance. The army bolstered its positions, posting a dozen armored vehicles and Jeeps along the border road. A small group of youths managed to cut through a recently fortified coil of barbed-wire and took up positions in a trench inside a buffer zone about 20 yards from a final border fence. Israeli troops periodically opened fire at young activists jumping into the ditch, sending puffs of soil flying into the air. 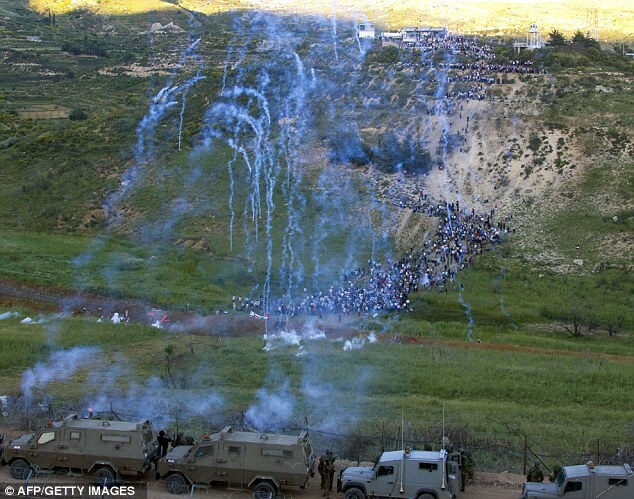 As the standoff stretched into the evening, Israeli forces fired heavy barrages of tear gas to break up the crowds. The fence had been breached in a similar protest last month marking the anniversary of Israel’s founding in 1948. In the 1967 conflict, the Golan Heights was captured by Israel along with the West Bank and Gaza Strip where protestors today clashed with Hamas riot police. Thirteen people were killed last month when Israeli forces tried to prevent thousands of Palestinians from overrunning its borders with Syria, Lebanon and the Gaza Strip. In the occupied West Bank, about 100 Palestinian protesters marched to an Israeli military checkpoint, where soldiers fired tear gas and the crowd fled. It was a deliberate provocation. The demonstrators were paid by the Syrian government.